Australians are spoilt for choice when it comes to esports betting sites with upwards of 10-licensed and regulated bookmakers having markets for one of the fastest growing segments in the gambling scene down under. The EsportBet.com team currently recommends the following legal online bookmakers for Australians. Home-grown esports talent is Australia is rapidly expanding into 2019, as is the rabid amount of fans rallying for bigger and better Australasia events and tournaments. With huge strides in the local Call of Duty, Counter-Strike: Global Offensive, Halo 5, League of Legends, Overwatch and Rocket League pro gaming circuits, it’s not long before Aussie teams begin to get more attention on the world stage. If you live in Australia and want to bet on both local and international esports tournaments, our special guide aims to point you in the right direction. Australians can choose from a large number of licensed and regulated esports betting sites with full betting markets for the most popular esports matches of Call of Duty, Counter-Strike: Global Offensive, Dota 2, League of Legends, Halo, Overwatch, Rocket League, StarCraft II and more. Aussies can also deposit and withdraw money for their wagers safely thanks to a range of secure banking methods supported at online sportsbooks – and you can also bet in AUD without the need for currency conversion fees. Keep this page bookmarked as we keep you updated on the latest changes in Australian esports betting. EsportBet.com recommends the following Australian sports betting sites to bet on esports with the best odds and sign-up bonuses. They carry the best range of esports betting markets and cover the majority of the biggest international and local esports tournaments, offering up-to-date head-to-head wagers, outright winners, futures, and exotics specific to the type of game (First Blood for CS:GO, as an example). Aussies are also spoiled with a ton of generous welcome offers and regular promotions which boost your account with additional bonus credits to place on bets, sometimes as simple as depositing a certain amount of money in a specified time-frame. 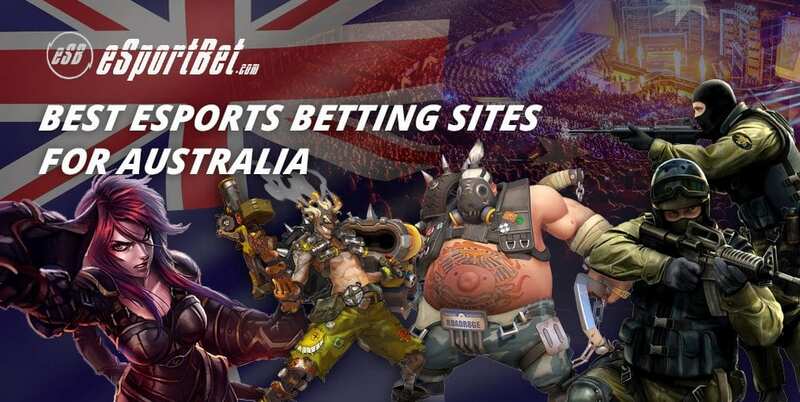 Sportsbet: The no.1 sports betting site in Australia by market share has a sensational range of international esports betting markets. You are doing yourself an injustice if you are not a Sportsbet account holder. Neds.com.au: Has rapidly evolved into one of Australia’s most popular online bookmakers and is known for their quirky advertising campaigns. Neds.com.au has esports markets on all of the major tournaments and leagues dotted around the world. Palmerbet: Is Australian-owned which is a rarity in this market. Does not have as many esports markets as other bookies with a greater focus on horse racing and domestic sports. Betfair: Is a betting exchange that does have an Australian-branch. This means you can accept bets as well as make them. Read our detailed Betfair review for more information about how this bookie functions. Topbetta: A brand that has now been around for a while, but is yet to really cement itself. Does have tournament betting but we have not seen any based around esports up until February 2019. Ladbrokes.com.au: Does have a great range of esports betting markets, but not as many as Sportsbet and BetEasy. Ladbrokes does have some nice promotions, although this often is dependent on which state you are in. Unibet.com.au: Managed by the Kindred Group, Unibet is a well-know global brand with roots in Europe, which means they are well covered in the esports gambling world. All of the above bookies are licensed and regulated by the Northern Territory government or other licensing bodies, which guarantees fair and timely payouts and that everything is legal and reputable for Australian punters, or globally trusted international regulators such as the United Kingdom Gambling Commission. Sign up for an account via any of our links for more information and the latest exclusive sign-up bonuses to kick-start your esports betting career with bonus cash. Is it legal to bet on esports in Australia? Yes, if you live in Australia and are over 18 you can bet on your favourite esports matches, players, teams and more at most esports betting sites. With many of the best European bookmakers fully licensed in Australian states like the Northern Territory and tons of home-grown Aussie companies going head-to-head with such international powerhouses, esports punters can wager safely and without worrying about whether anything isn’t legitimate and legal – which is fortunate compared to other countries with much more ambiguous sports betting laws. They can also look forward to a ton of sign-up bonuses due to the heavy competition, though the sign-up bonuses themselves and the way they are advertised to punters have to follow individual state laws, so you may find yourself ineligible for certain promotions advertised in other states. In Australia, you have to be over the age of 18 to bet or gamble online, and you must provide bookmakers with reasonable proof of identity if you wish to bet with real money and withdraw your winnings. You can see whether you are eligible for a sign up bonus in our bookmakers table above. The online bookmakers we recommend to Australian esports bettors have a great range of banking methods to deposit betting money and withdraw potential winnings safely and securely. Credit and debit card: Using MasterCard, Maestro and Visa-branded credit cards and debit cards is supported at all major online Australian bookmakers, and is often the fastest way to get your money into your account for deposits and back to your personal bank for withdrawals (instantaneous). Unfortunately, American Express is not accepted at most bookies. Direct bank transfer: Many online bookmakers allow AU players to wire money directly via their online banking interface, and all banks in the country, including ANZ, Commonwealth, NAB and Westpac support direct bank transfers at Australian licensed bookmaker sites. This option takes anywhere between 24 hours to 10 business days to process transactions, so be mindful of processing times prior to using it for deposits or withdrawals. e-Wallets: E-wallet digital payment options (also called Web wallets) like Neteller and Skrill are supported at most online bookmakers for esports betting, though they often come with additional fees which are unfavourable. Web wallets are best for esports bettors who want additional privacy and don’t want to connect their betting activities with their personal bank accounts or cards. Online payment services: PayPal is offered at the majority of our recommended esports betting sites and owing to its reputation is extremely safe and fast when it comes to processing deposits and withdrawals. POLi is an Australian-run online payment service and recommended deposit option alternative to PayPal supported at most major online bookmakers. Pre-paid cards and digital services: Entropay and Paysafecard virtual pre-paid cards can be used at Australian bookmakers for esports betting deposits. Depositing money into your chosen online bookmaker to bet on esports is an easy and fast. While every real money betting site has a different interface, depositing and withdrawing remains the same process: Sign up for a new account via our links, verify your personal details, login to your account and visit the ‘banking’ or ‘cashier’ section of the site and choose from the list of banking options offered to transfer your first deposit and get started. You can withdraw money in the same cashier section once you have won from your wagers. As is standard with all types of online betting, you have to provide documentation with your preferred bookmaker (DOB, personal ID, address and contact details) prior to being able to withdraw any money. How popular are esports and video games in Australia? According to consumer insights from NewZoo, there are over 900,000 esports enthusiasts recorded living in Australia in 2018. Grouped up with the rest of Oceania, Australian esports fans were responsible for a palty 0.3% of the $32 million in total ticket revenue earned from major esports events in 2016 (around $96,000) and 3% of pro gaming events held globally (out of 424) that year with prize-pools above $5,000. Australia and the rest of Oceania also accounted for 0.4% of the total recorded $93.3 million in major event prize money handed out to esports winners in 2016 (around $373,200). The editorial team at eSportBet.com fully expect these figures to skyrocket in 2018 thanks to Australia’s increased involvement with international esports leagues like the upcoming Overwatch League and the introduction of the first ever Intel Extreme Masters event held in Sydney in 2017. Esports popularity in Australia is due to the country being one of the fastest growing video game markets in the world. There are over 10.6 million gamers in Australia who will spend $1.2 billion in 2017, making it the 14th largest video games market around the globe according to NewZoo. There is also over 16.7 million smartphone users gaming on their mobile devices. PC gaming dominates the Australian gaming landscape, and about 64% of computer and laptop gamers in Australia aged between 21-35 and predominately male. What esports games can i bet on down under?